The A1 Floor Stand 1000 is a collapsible A1 double sided 1000mm high floor stand, intended for indoor use but can be adapted for outdoor use at an additional fee, with or without full colour print. Custom sizes are available on request although dependant on quantity. The A1 Floor Stand 1900 is a collapsible A1 double sided 1900mm high floor stand, intended for indoor use but can be adapted for outdoor use at an additional fee, with or without full colour print. Custom sizes are available on request although dependant on quantity. 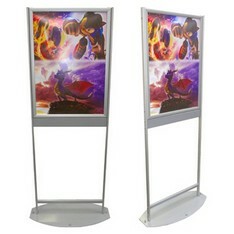 The A1 Free Stand is double sided and 1900mm high, intended for indoor use but can be adapted for outdoor use at an additional fee, with or without full colour print. Custom sizes are available on request although dependant on quantity. 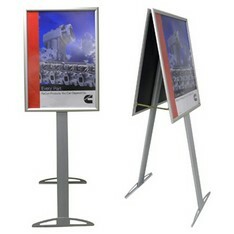 The A1 Free Stand 2 is double sided and 1900mm high with 2 x A1 Double Sided Magnetic Frames and square upright legs, intended for indoor use but can be adapted for outdoor use at an additional fee, with or without full colour print. Custom sizes are available on request although dependant on quantity. 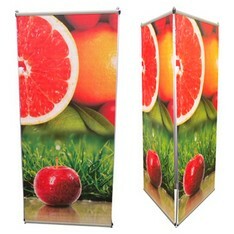 The A1 Free Stand 3 is double sided and 1900mm high with A1 Double Sided Shutter Frame and oval aluminium upright legs, intended for indoor use but can be adapted for outdoor use at an additional fee, with or without full colour print. Custom sizes are available on request although dependant on quantity. 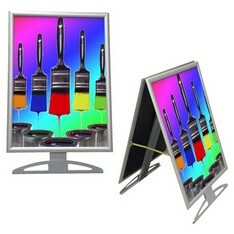 The Floor Stand Easel is steel constructed and epoxy coated in silver colour. The system present an adjustable opening of 230mm to 1530mm to house a Shutter Frame, Picture Frame and or display panel – fully collapsible and compact. 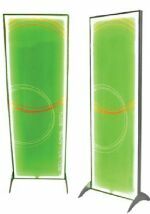 The Floor Stand Life Like (594mm x 1675mm) is double sided 1900mm high floor stand, intended for indoor use however can be adapted for outdoor use at an additional fee, with or without full colour print. 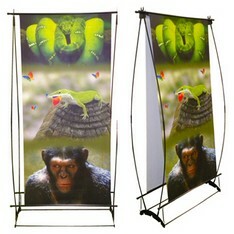 Custom sizes are available on request although dependant on quantity. 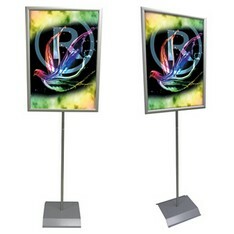 The Floor Stand Life Like 4 LED (650mm x 1900mm) is a double sided 1900mm high floor stand with Double Sided 42mm Fabric Stretch Frame and LED internal edge lighting intended for indoor use, with or without full colour print. Custom sizes are available on request although dependant on quantity. 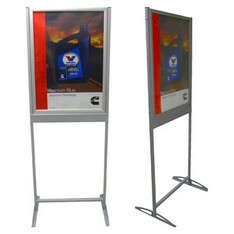 The Floor Stand Life Like 2 (594mm x 1675mm) is a double sided 1900mm high floor stand with Double Sided Shutter Frame and square upright legs, intended for indoor use however can be adapted for outdoor use at an additional fee, with or without full colour print. Custom sizes are available on request although dependant on quantity. The Floor Stand Life Like 3 (594mm x 1675mm) is a double sided 1900mm high floor stand with Double Sided Shutter Frame and oval aluminium upright legs, intended for indoor use however can be adapted for outdoor use at an additional fee, with or without full colour print. Custom sizes are available on request although dependant on quantity. 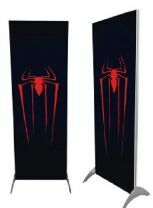 The Floor Stand Life Like 4 (650mm x 1900mm) is a double sided 1900mm high floor stand with Double Sided 42mm Fabric Stretch Frame intended for indoor use, with or without full colour print. Custom sizes are available on request although dependant on quantity. 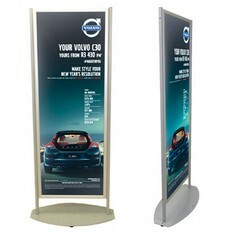 The Poster Stand Standard Base includes a removable steel constructed base and epoxy coated in silver colour and a 2000mm collapsible aluminium pole. A range of Shutter Frames and or Picture Frames ranging from A4 to A1 could be adapted to suit the system, with or without full colour print, single or double sided. Custom size Shutter Frames and or Pictures are available on request to suit the system. 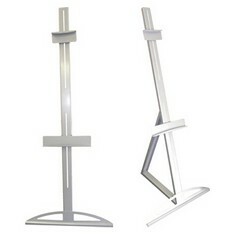 The Poster Stand Tripod Base include three removable base legs constructed from steel and epoxy coated in black colour, an aluminium tripod base holder epoxy coated in black colour and a 2000mm collapsible aluminium pole. A range of Shutter Frames and or Picture Frames ranging from A4 to A1 could be adapted to suit the system, with or without full colour print, single or double sided. Custom size Shutter Frames and or Picture Frames are available on request to suit the system. 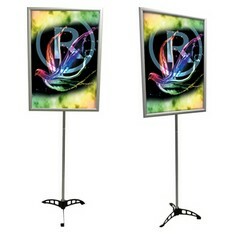 The Spear Stand is a double sided self standing display device that accommodates a print size of 800mm X 1780mm with carry bag, with or without prints – fully collapsible and compact. 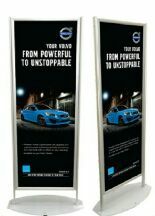 The Tri Banner is a three sided self standing display devise that accommodates a print size of 910mm X 2070mm with carry bag, with or without print – fully collapsible and compact. 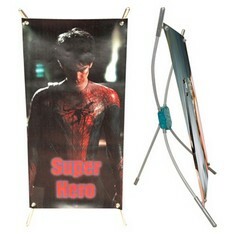 X Banner XS1 is a single sided self standing display device that accommodates a print size of 750mm x 1750mm with carry bag, with or without print – fully collapsible and compact. 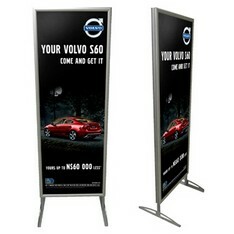 The X Banner XS2 is a single sided self standing display device that accommodates a print size of 600mm x 1700mm with carry bag, with or without print – fully collapsible and compact. 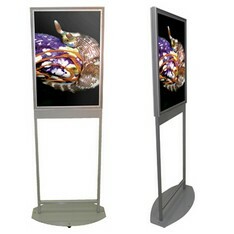 The Table X Banner (XS-3) is a single sided self standing display device that accommodates a print size of 200mm x 400mm with carry bag, with or without print – fully collapsible and compact.